The Forno Buono Napoli pizza oven is both portable and easy to relocate, a welcome change from some of the heavier outdoor pizza ovens on the market today and although it offers a smaller cooking space than some of the previous ovens that we have reviewed, the price tag is certainly enough for you to consider cooking those additional pizzas a little later than planned. Priced at £154.95 at Amazon UK at the moment thanks to a whopping 38% off the recommended retail price of £240, it really is a good little addition to those warm summer evenings and your social gatherings when you want to offer up something a little different to the more traditional BBQ. As well as being offered with a 38% saving on the RRP, if you buy during this limited period, you will also receive a free fitted cover from Forno Buono, helping to maintain and look after your oven when not in use, once again saving £17.49 on the price. Made from a steel body, the Forno Buono has been powder coated in black, making it very easy on the eye and even more so when you roll it out onto your decking or entertaining space while your guests are present, whereas some of the larger pizza ovens on the market today can be very focal in smaller gardens and outdoor spaces. Offering a cooking space of 49.5cm x 36.8cm x 28cm, it has ample space to be able to slide in your own pizza creation and enable your guests to sample rustic cooking at it’s finest, with a real smokey flavouring while cooking to perfection thanks to the retention of heat. Now this is where the Forno Buono Napoli pizza oven comes into it’s own element, there is a secondary compartment on the oven which is located above your cooking area, this is a smoker and means that as you cook your food below, other items can benefit from the addition of real wood or charcoal smoke being passed over it. 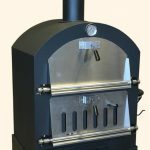 The Forno Buono Napoli does come with a need to assemble it yourself, however the instructions that were provided were easy to follow and generally those that have purchased this product have said that it takes roughly 90 minutes to be completely set up and ready to give it a test run. Don’t be fooled into thinking that due to the great price and the smaller size, that the Forno Buono Napoli is solely for pizza cooking either, it has a great amount of ability and will make you the perfect meat joint that is ready to melt in the mouth. Considered to be one of the lower priced ovens on the market at the moment but with the huge selling point of being able to move it easily thanks to the wheels and lightweight structure, it could be a real option for those that are a little nervous about whether they would get enough use out of an outdoor oven without spending the Earth on a more premium brick product. Remember: The FREE cover offer is only for a limited time – So buy now!